This ghostly riddle keeps on track as the audience is taken on a ride with plenty of twists and turns. And you will jump out of your seat on several occasions. No-one would choose to be stranded in a cold railway waiting room with a disparate group of passengers, still less having been told that anyone who sets eyes on the 'ghost train' will die. It's all the fault of Teddie Deakin, who having lost his hat on a train, pulled the communication cord causing everyone to miss their connection to Truro. 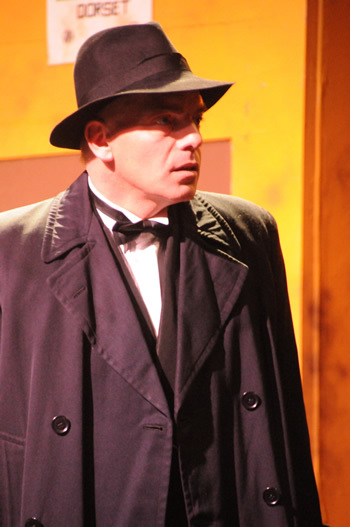 Sam Moulton puts in just the right amount of eccentricity in the role, coupled with boundless energy. 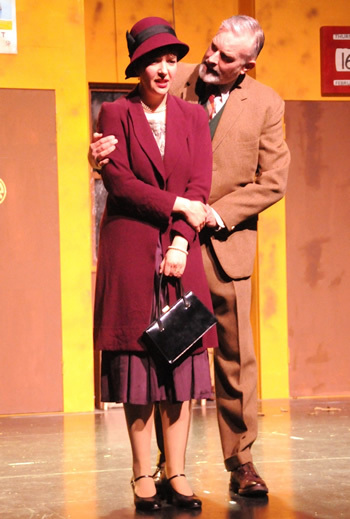 Jan Stevenson's is perfect as the aged spinster Miss Bourne as she flusters and frets, whilst Richard Neal embodies the forthright and bossy Richard Winthrop trying to save his marriage to Elsie, played with self assurance by Tracey Nicholls. Rob Cording-Cook and Jemma Cable gel nicely as newly weds Charles and Peggy. 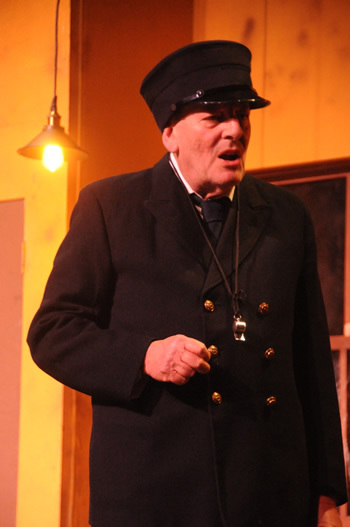 Russ Guillaume is very believable as the jobsworth stationmaster as he tells the sinister story behind the supposed 'ghost train'. 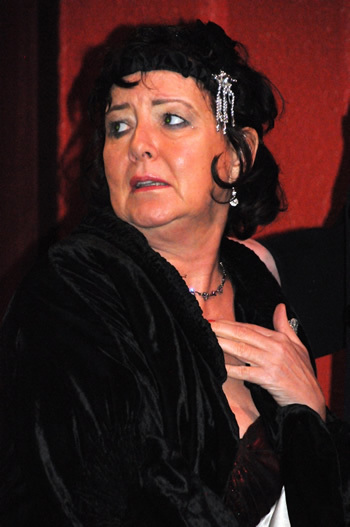 Ann McColgan-Clark is vibrant in the role of Julia who emerges from nowhere in evening dress. 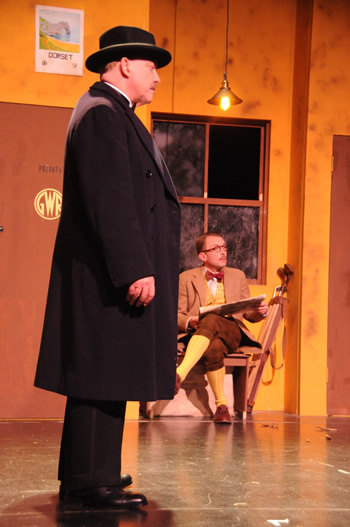 Herbert Price (Paul Dodman) and John Sterling (Chris Durham) seem sinister at the outset - and it turns out with good reason. 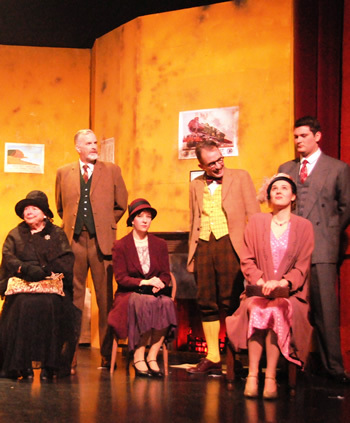 John Bruton, David Beddard, Carol Bruton, Calum Hearne and Gary Paine complete the cast in supporting roles. 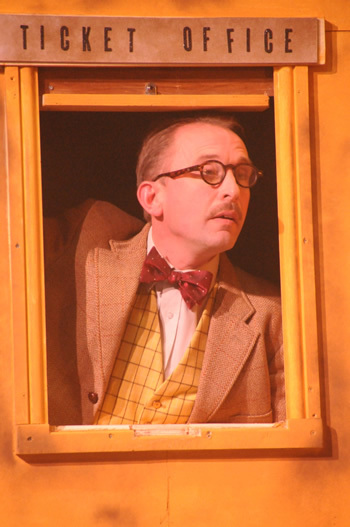 Director David Pile and set designer Colin Pile should be applauded for providing plenty of atmosphere, making it easy for the audience to imagine a train had arrived in Wimborne. Take a journey back to the 1920s this week, as The Ghost Train, written by Dad's Army's Private Godfrey Arnold Ridley, runs until Saturday..
IThe problem with writing a review of a mystery is that I have to avoid giving away what happens, because a significant number of the people who will read this will not want to know until they see it. For example, I can’t refer to individual performances by actors who appear as part of the denouement or reveal that some characters may not be all that they appear to be. I don’t think I am giving anything away by stating that the play was written in 1923 by Arnold Ridley, who famously played Private Godfrey in Dad’s Army, as that is a well-known trivia fact. It was, apparently, his most successful play. The static set comprises a station waiting room, with a central door and windows onto the platform behind and a door and ticket window onto the stationmaster’s off-stage office. A nice touch is the clock on the wall of the waiting room, which (unusually for a stage show) is a real clock showing the time of the action on stage during the night of the action. When one of the characters on stage asks what the time is, another responds that it is just after midnight – and it is, according to that clock. We don’t have long to wait for the first train – lighting, sound and smoke effects at the rear of the set – and neither do the four members of the cast who are waiting for it, but that train and those people who depart on it are not the subjects of this drama. The next train brings in the six passengers, each with his/her own personality and back-story, who find themselves caught up in the mystery. 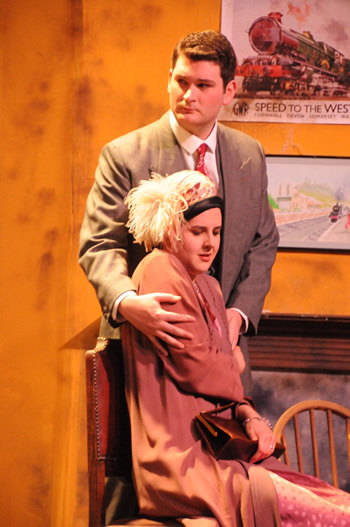 The tale told to them by the old stationmaster (Russ Guillaume) sets the scene for much of the suspense. This is the sort of show where the individual performances of the actors have to take second place to the plot and the effects which variously have us on the edge of our seats, shock, surprise and frighten us. The parts, however, are well cast, well rehearsed and well acted. The annoying whine that Sam Moulton affects as the voice of the character Teddie (who has occasioned the crisis by pulling the communication cord) is, occasionally, a mite unintelligible – but he is supposed to be a twit who talks rubbish anyway. The meandering around the stage and gesturing by some of the characters during monologue sections seems a bit forced and unconvincing, but we soon forget about that as the tension mounts. The execution and timing of the special effects and the sounds is excellent: top marks to Colin Pile for this as well as for the set. 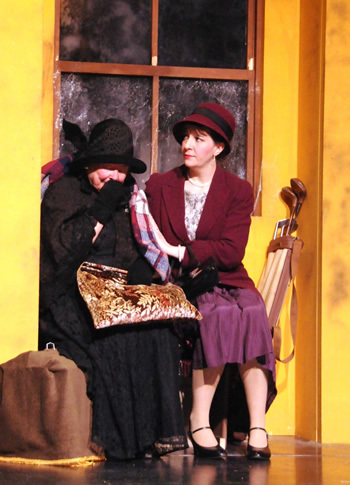 The opening night audience packed both floors of the Tivoli Theatre and everyone was enthusing about it afterwards – proof that at nearly 100 years old, the play still works today. If you have a ticket for one of the remaining shows, then you have a treat in store. If you haven’t, then see if you can acquire one, or you will miss this classic gem.